The Cactaceae or Cactus Family has several distinguishing characters the most well-known are the ever-present protective spines which are modified leaves developed to minimize water transpiration, cool the plant and provide protection from would-be predators. Although it's well documented that many animals have adapted strategies to which the spines provide no relief. Cactuses, or the generally accepted term, cacti, come in many forms, shapes and sizes many with beautiful forms and flowers, often pleasantly scented to attract localized pollinators, both vertebrates and insects as well. Most cacti are succulents but not all succulents are cacti. Almost all traditional cacti are native to the Americas and are specialized to thrive in areas with minimal rainfall and extremely dry conditions. 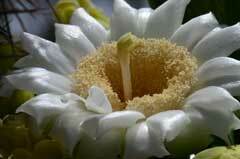 In North America that area 53 genera and 465 accepted taxa overall for Cactaceae. The Plant List recognizes 174 genera and includes 2,047 species names. Some of the largest Cacti genera in the Americas from the The Plant List; and in North America by the USDA Natural Resources Conservation Service. All data is approximate and subject to taxonomic changes. The Plant List. Published on the Internet; http://www.theplantlist.org/ (accessed 07/24/2017).